What The Flame is not: This is not a five-star restaurant. Three to four stars perhaps. Moreover, the food will not win any awards (except maybe the trout almondine — my weakness). But you will always leave satisfied and full, without the dent in your budget. At first glance, the host El Cortez Casino seems like the worst possible location for anything beyond a coffee shop. It’s not just in downtown Las Vegas, which has seen better days, but it’s sequestered on the far east side of Fremont Street, far removed from the popular anchor attractions such as the Golden Nugget and other renovated casinos. But from the moment you enter the El Cortez, with its walls decorated in Las Vegas nostalgia, you can see this place is very much the real deal. It’s easy to see why this casino survives and even thrives when most of the older attractions are struggling or have closed down. Jackie Gaughan, the gambling legend who pretty much built and ran the El Cortez for decades, still walks the floor almost every day. Now an emeritus advisor to the property and well into his 90s, Mr. Gaughan actually lives in the hotel and dines at The Flame multiple times each week. Call me old fashioned, but there’s something special about enjoying a great meal and seeing many Las Vegas residents make a special trip over to greet Mr. Gaughan at his table, who is one of the city’s last living pioneers. The restaurant is about the size of a basketball court, which means it can probably accompany about 120 diners. Seating is a mix of booths and four-top tables with comfortable leather chairs. White tablecloths and napkins. Plenty of televisions are conveniently positioned around the room, which may seem odd for an upscale restaurant. But this is Las Vegas and many of the patrons (including yours truly) can easily follow a ball game while enjoying good fare. During football season the televisions are always tuned to the most popular game, which tends to change the atmosphere a bit. But on most nights the televisions show a muted loop of European travel documentaries that – oddly enough – tend to enhance the atmosphere. Adding to the feeling of cozy comfort is the live piano player who performs five nights per week. The music is soft and requests are taken. It’s nice to see at least a few restaurants haven’t lost this touch. Like I said, if you want some loud techno-pop boombox playing while you are struggling to order a meal, head over to the Cosmo or Aria – not here. I keep bringing up the affordable prices, but this is a huge factor in my grading. Anyone can find a good meal if you plan to spend $100-200 a head. But try finding as good a meal at $50 a head. Go ahead, give it a try. You’ll be disappointed or over budget. Well, welcome to The Flame. No doubt, food served here would cost double on The Strip. The trout almondine costs $18. That’s right – eighteen dollars. And, the trout are flown in daily from the crystal cold waters of Idaho (seriously, I hear they send a limo to the airport for the delivery). Be sure and ask for the “black butter,” as well. There’s nothing on the menu above about $30, other than the lobster perhaps. Side dishes (garlic spinach, asparagus, baked potato, etc,) are $5 a piece. Like I said, you can get an appetizer, main course, dessert, and cocktail (plus tip) for around $50. “Splurging” here means you will probably get set back about $70, which doesn’t even get you in the door at half the snob-factories elsewhere around town. Menu items include several kinds of fresh fish, all the standard cuts of steak, pasta, and enough variety that just about anyone will be happy. The Flame also offers regular specials. A few months ago, they had a menu with 1985 prices (seriously!). Probably the best deal is a FREE bottle of wine with the purchase of two entrees. See the Friday “Neon” section of the Las Vegas Review-Journal and clip the free wine coupon. And yes, it’s actually a free bottle – something in the range of Clos du Bois. 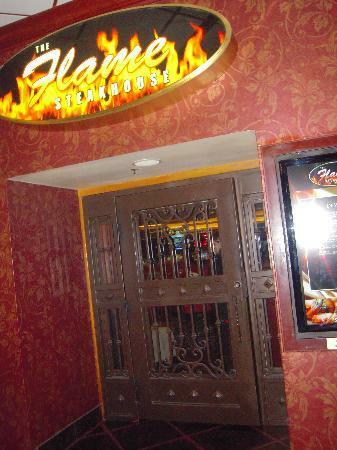 The Flame is open seven days a week, from 4 to 10 pm. There’s an early rush which peaks between 5 and 6 (remember, this is a locals’ place). Most of the clientele is over the age of 50. Again, this restaurant is not trendy and chic, it’s classy and subdued. The only disappointment, and I am being really picky here, is the dessert menu. Most of the items appear to be made outside and are brought in. It would be nice to see some fresh-made specialties. I mentioned this during one of our visits and noted that The Flame recently added Strawberry Romanov, with Cointreau as the key ingredient (not saying there’s a connection, but who knows?). But given the portions and value on the earlier courses, you may not have room for dessert anyway. A final word: Once gets the feeling that this restaurant is here to compliment the casino. It’s not a profit center, which is why the prices are so reasonable and the portions are such a bargain. It’s essentially the revisionist business philosophy that built this town that virtually everyone else has long since forgotten, that people are offered something and they feel like they got a good deal, they will come back again and again. They might even gamble a few dollars at the tables. Too bad, that old way of doing business has gone the way of the dinosaur elsewhere. When I go to a restaurant I want to eat –— and that means eat good creative fresh food, at a reasonable price, and get excellent service. You get all that and more at The Flame.